First the BABY was born & then the Baby was born. Kazmir Valentine Loves Tacos. Its redundant but its true. We have always loved small shops with big personality, big hearts, a certain music that exists only in those spaces. A condenser working overtime. A screen door waving in the wind. Strangers eat together and become friends. Something more than a transaction. Something beyond technique, the branding on a bag, the promise of a glowing review. Kat’s family owned Muscianesi Meat Market in Brooklyn for close to 75 years. Zack’s family owned a butcher shop & grocery in McDonald. The idea of creating a space for neighbors to become friends, a place to feed and be fed, a small taco shop where we could serve the community, was exactly what we had been missing in all of the years working for other people. A lot has changed since we began doing pop-ups in November 2016. We have a storefront now. We changed the format from ordering from a cashier and waiting for your food to be prepared to a more familiar assembly line of sorts. Our hours have changed. We are open all day now. We have added a small team of co-workers and grown our catering business into a significant piece of our operation. We’ve added artwork from friends and customers. 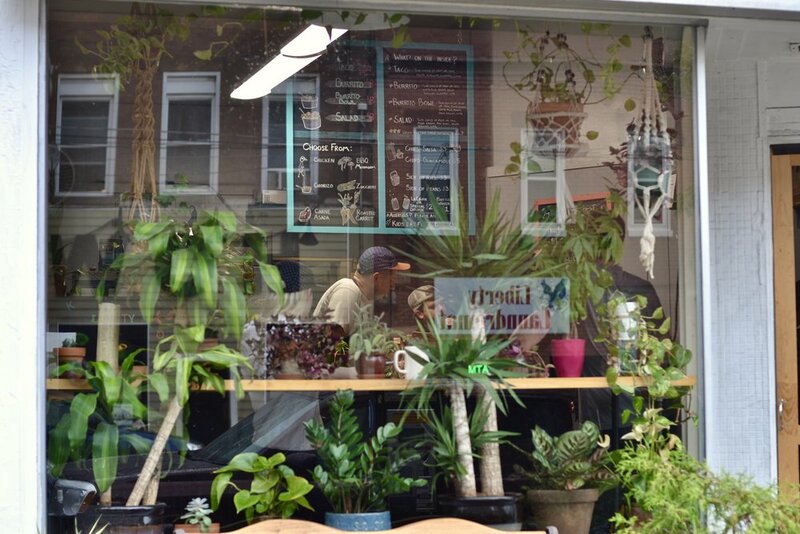 Kat’s plants have multiplied, now covering the front window and providing much needed fresh air and inspiration. The food however has not changed. We’ve had a very clear idea from the beginning: to serve bright, nourishing, accessible food. So the food we serve in season is often sourced from the Bloomfield Farmers Market, and from area purveyors like Todd at Tiny Seed Farm, from John at Garfield Community Farm, from Brian Greenawalt, from the Kennedy Family. We break down proteins and vegetables every day. We make our own salsas, slaws, pickled vegetables. And unlike the vast majority of restaurants we have a 100% electric kitchen which is both cleaner for the restaurant and for the environment. It’s amazing what you can produce with minimal equipment! We focus more on technique and freshness than gadgets & flowery menu descriptions. Our hope is to create food that satisfies and nourishes. It has always been about serving food that we would eat, that our friends, family, & neighbors would eat. We get excited about making people smile, introducing people to new preparations of vegetables, asking questions about the salsas and garnishes. If you are hungry we’ll feed you. Our doors are open for everybody. Every body eats.